This post was written by Craig Dunn, Principal Program Manager at Xamarin. This announcement is a cross-post from the Xamarin blog. 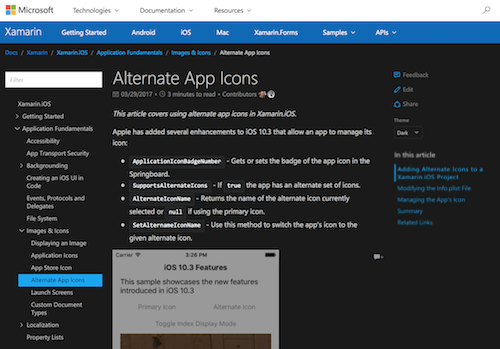 All our documentation options are a click or two away from docs.microsoft.com/xamarin. Click Xamarin in the header to return here from any page. 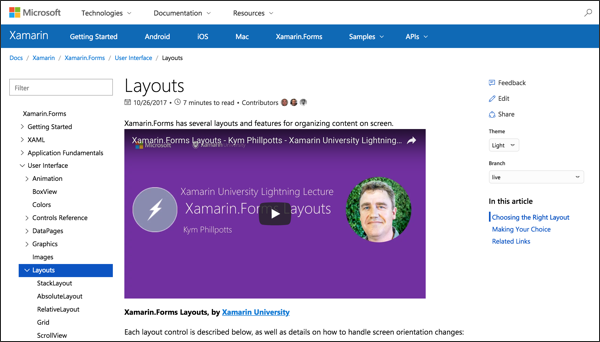 Use the platform links to see our mobile developer docs, and switch to the Graphics & Games or Tools tabs to learn more about related topics such as SkiaSharp, Workbooks, and the Xamarin Live Player. 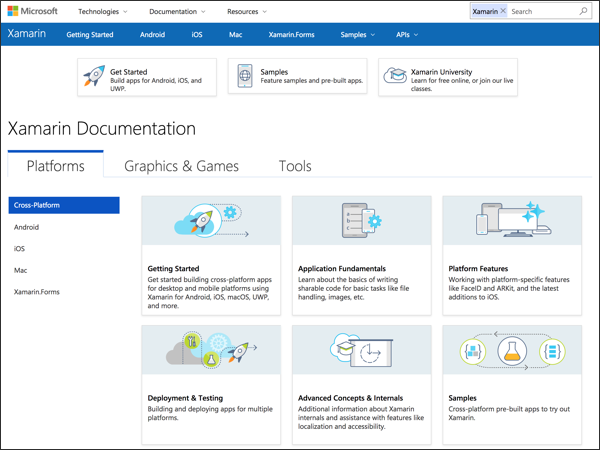 Platform home pages – Overview and quick reference for the docs available on each platform. Use the links in the blue header bar to visit each platform page: Android, iOS, Mac, and Xamarin.Forms. 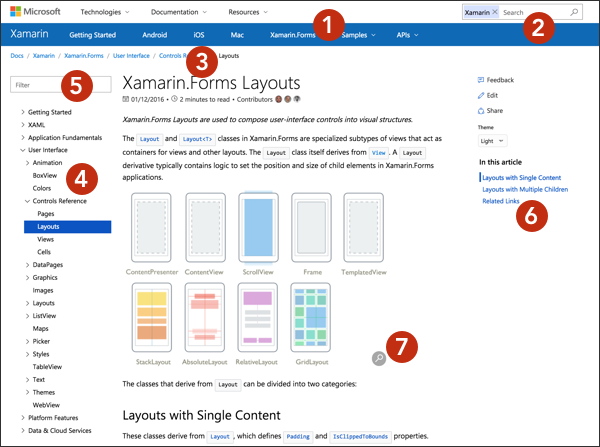 Search – Click the magnifying glass at the right of the header to search Xamarin content. Breadcrumbs – Tucked under the header, breadcrumbs help find your way to related docs. Navigation tree – Quickly drill down using the tree-view. Navigation filter – Filter the navigation tree to find a topic heading. In this article – Each article has a table of contents generated, including a handy indicator for your scroll location in the doc. Image zoom – Images with a magnifying glass icon in the bottom-right corner can be clicked to show more detail. Each page contains an Edit link so that the community can contribute fixes and updates. Comments on the docs become GitHub issues so you track the progress of your docs feedback. Read the contribution guidelines for instructions on submitting changes. Using a combination of translation techniques, Xamarin developer documentation is now available in 13 languages besides English: Chinese (Simplified), Chinese (Traditional), Czech, French, Italian, Korean, German, Japanese, Polish, Portuguese (Brazil), Russian, Spanish, and Turkish. Visit the docs blog for more information on international features. 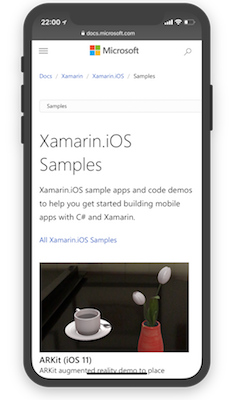 The Xamarin BCL API docs are already available in the .NET API Browser, and our platform-specific APIs are coming soon. There’s even an option to read the docs with a Dark Theme! You’ll notice some content is still hosted on our old site, including API docs, Workbooks, and Samples. The team is working hard to migrate these to create a unified experience. It’s with a heavy heart that we say goodbye to our old site at developer.xamarin.com, however I’m excited by the new features available on docs.microsoft.com/xamarin and look forward to building an even bigger, better documentation experience for Xamarin developers. Let us know what you think in the forums. P.S. : If you’ve bookmarked or blogged links to the old developer site, don’t worry: they’ll be automatically redirected to the equivalent page on the new site!